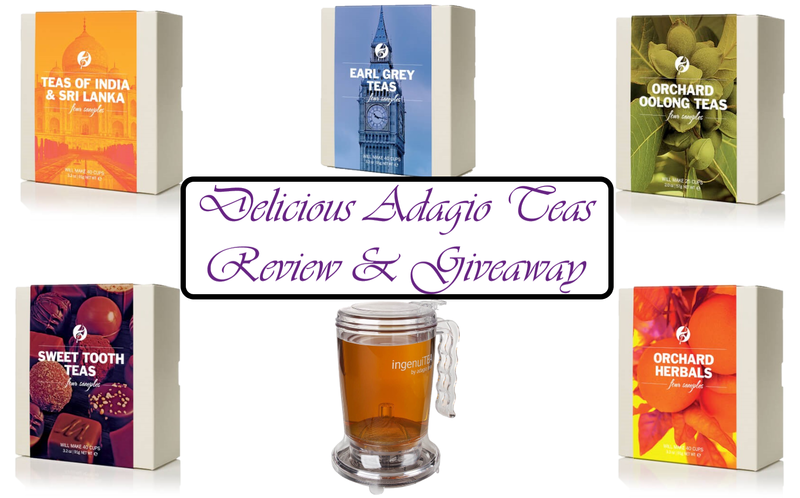 Delicious Adagio Teas offer a wide selection of gourmet teas, some of which I received to review. I also have some samples and an IngenuiTEA Infuser for one lucky winner, simply enter the Rafflecoptor below. Adagio Teas are hand-picked sourced from the origin, working directly with the farmers who produce them in their native countries. Coming straight from the source means Adagio Teas are brimming with far more nutrients. All of Adagio Teas are full leaf with no added sugar and all-natural flavours. They also have a lovely herbal range for those preferring caffeine-free teas. Adagio Teas are Vegan and Gluten Free, all flavours in herbal teas are from essential oils and the traditional teas are pure leaves. Not only do Adagio Teas offer a fine selection of artisan teas, but they also have a fantastic range of Teaware. PersonaliTEA Porcelain Small Tea Cups, Teapots & Cups with Infusers. This range comes in multiple colours & I kindly sent out purple for my review. The elegant purple 600ml ceramic teapot has a large infuser basket for loose tea. The non-drip spout is fantastic for avoiding spills and it just looks gorgeous! To finish the set the 2 matching cups are 120ml and both the teapot and cups are dishwasher safe. The purple porcelain cup and infuser with lid has a stainless steel infuser for loose tea leaves. The lid doubles as a coaster for the infuser when it is time to remove the tea leaves. This 350ml cup is 9cm in diameter and as with the rest of the purple porcelain, dishwasher safe. Each of these sample boxes contains 4 different artisan loose leaf teas of various flavours. Each flavour is individually packaged in resealable pouches for easy storage & freshness. Along with the sample boxes we received two special collections including the Fairy Tales Pyramid Teabags andThe London Collection. The girls insisted we try the Fairy Tale Pyramid Teabags first, no surprise there! This stunning collection includes ‘Sleeping Beauty’, ‘Snow White’ & ‘Cinderella’. A herbal tea blend to wake Sleeping Beauty from an ageless sleep. Magically created by the good fairies Flora, Fauna, and Merryweather. We decided to try the Sleeping Beauty tea First, both girls had to join in so we used Izzy’s tiny Frog mug too. This collection is caffeine-free so it’s perfect for anyone looking for a caffeine-free tea that is tasty too! The Sleeping Beauty tea was divine and one we all really enjoyed. The fairytale collection is amazingly delicious and the tins are lovely to keep. A Pumpkin tea blend to transport Cinderella away from the wicked stepmother, to the Royal Ball and the attention of her Prince. Looking for an infuser that will attach to any cup? The IngenuiTEA is the answer! Simply add your tea leaves, pour in hot water and let them steep. When you place the IngenuiTEA Infuser on top of your cup it will release a valve. This valve allows your tea to flow down into your cup whilst the mesh filter retains your leaves. Easy to clean and dishwashable, this fab device fits cups up to 9.5cm diameter and is BPA-free. Contact details will be pass on to Adagio Teas solely for the purpose of sending out your prize. Do you love the sound of Adagio Teas?